Appleton Estate Jamaica Rum is proud to announce the release of a world first in Rum, the very rare Limited Edition Appleton Estate 50 Year Old Jamaica Rum - Jamaica Independence Reserve. In 1962 just before Jamaica received its independence, several barrels of rums from the Appleton Estate were set aside to age with the edict that these rums were to be used to create a very special blend of 50 Year Old Rum that would celebrate the 50th Anniversary of Jamaica’s Independence. These rums were placed in a special area in one of our ageing warehouses and for fifty years they were carefully monitored, first by Master Blender Owen Tulloch and then by current Master Blender, Joy Spence. As the rums rested in the oak barrels a transformation took place as rich, complex flavours and aromas were developed naturally from the interaction of the rum with the oak and the rums also became very smooth and mellow and developed a dark mahogany colour. 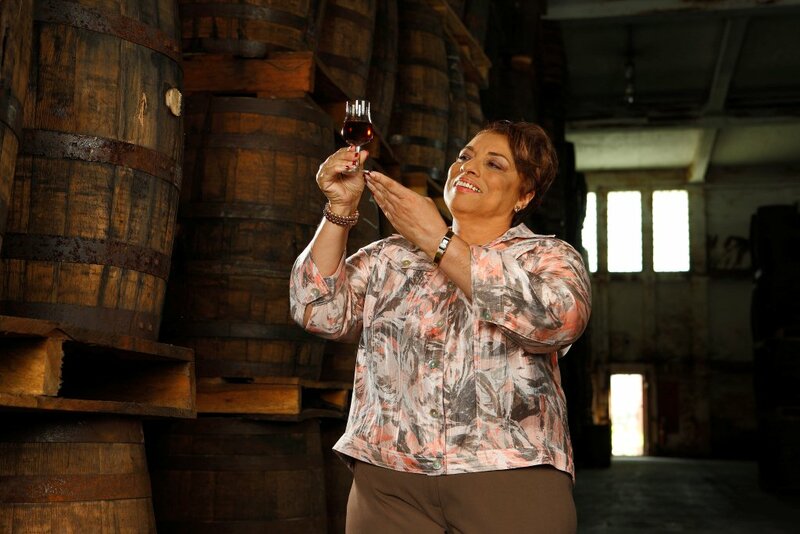 In preparation for the 50th Anniversary of Jamaica’s Independence, Master Blender Joy Spence conducted extensive quality checks on each barrel of rum to ensure that it had achieved the smoothness, complexity and richness worthy of the Appleton Estate Jamaica Rum 50 Year Old – Jamaica Independence Reserve. Once Joy confirmed that the barrels had aged to perfection, each barrel was then individually rolled out of the warehouse to ensure that its cherished contents were protected. After resting in oak barrels for fifty years, the final phase of the precious rum’s journey had begun. Under Joy’s watchful eye, the cooper carefully removed the bung from each barrel and after resting in oak for fifty years the Appleton Estate Jamaica Rum 50 Year Old Jamaica Independence Reserve was finally released. Joy once again conducted extensive quality tests and the blend was then placed in a special vat to rest and allow the “marrying” process to take place. During “marrying” process, the character, flavor and bouquet of the rums fused together creating a fuller and more rounded product. Appleton Estate 50 Year Old Jamaica Rum – Jamaica Independence Reserve is believed to be the oldest rum in the world available for sale and only 800 bottles of this very rare, Limited Edition bottling will be made available for sale around the world at a target Retail Price of US$5,000 per 750ml bottle. This very rare, Limited Edition rum was launched on June 7, 2012 at Jamaica House in Kingston, Jamaica and was attended by a number of dignitaries including the Prime Minister of Jamaica, the Most Honourable Portia Simpson- Miller. “We are very proud of the Appleton Estate 50 Year Old Jamaica Rum - Jamaica Independence Reserve, believed to be the oldest rum available for sale in the world. This Limited Edition, minimum aged rum is truly an exceptional spirit that encapsulates the world-class Appleton Estate Jamaica Rum range and the Appleton Estate where we have been producing exceptional rums since 1749. “The Appleton Estate 50 Year Old Jamaica Rum will be sold on allocation globally through select, specialist premium Retailers, exclusive style and classic on-premise partner accounts and select Duty Free stores around the world. Dark mahogany colour with rich coppery reflections and a very pronounced green ring of ageing. Powerful oak infused with rich vanilla and layered with cinnamon, maple and orange peel. Exceptionally smooth with a honeyed oak finish. A rum that is truly worthy of celebrating the 50th Anniversary of Jamaica’s Independence. The Appleton Estate 50 Year Old Jamaica Rum – Jamaica Independence Reserve is bottled at 45% alc/vol. Share your thoughts in the forums!